Coleslaw might be the most American dish ever created, but it wasn't something I ever thought about much . . . until my first trip to New Orleans. Our very first meal in that crazy food city was lunch at Uglesich's, an only-in-New-Orleans kind of place. It was a divvy joint in kind of a rough neighborhood — tables scattered around in no particular pattern, cases of beer piled against the walls — but there was a line out the door, and all around us, members of New Orleans high society and captains of industry were chowing down on fried catfish, fried okra, and gumbo. We were in the 'hood, and we were underdressed. Everything we ate at Uglesich's was great, but the coleslaw was a real surprise. We couldn't figure out why it was so good: rich, smooth, savory, and spicy, all at once. Finally, I got Andrew Uglesich to spill about the secret ingredient. The little bits of green in the coleslaw? Pickled jalapeños. Pickled jalapeños are pretty widely available, but if you can't find any in your local grocery, you're going to have to use my recipe, which definitely makes this slaw a plan-in-advance two-step process. I haven't used cup measurements for the vegetables here: coleslaw is one of those things where exact measurements just don't matter. 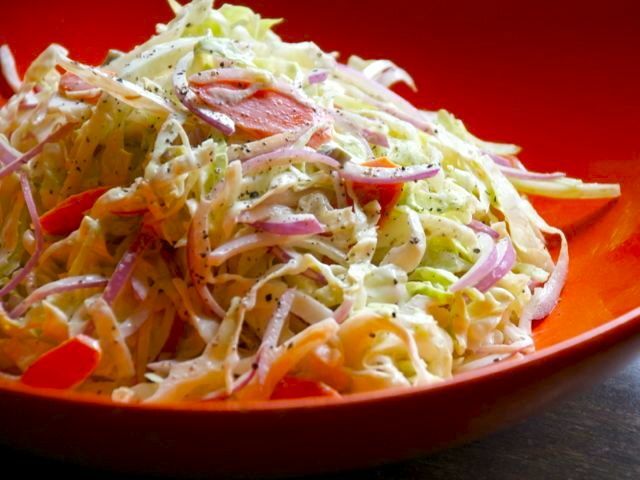 And since cabbage grows big, you're definitely going to have a lot of slaw, so plan on feeding a crowd. Make the slaw: Cut off the stem of the cabbage and peel off the outside leaves, removing any brown pieces. Using a large knife, slice the cabbage into quarters. Cut away the thick core on the inside of each quarter. Then slice each quarter right through the layers, so you end up with thin ribbons. Pile the sliced cabbage in a (very) large bowl. Slice the carrots as thin as possible. (Some people like to shred them, and you can do that if you have strong feelings about it, but I like slicing better; the bigger pieces make for better eating.) Add the carrots and red onions to the bowl. Cut the ends off the jalapeños; slice each jalapeño lengthwise, cut away the core, and remove the seeds. Then slice each jalapeño crosswise into small thin pieces. Add them to the bowl. Make the dressing: In a medium bowl, combine the mayonnaise, sour cream, celery seed, jalapeño juice, mustard, Tabasco, salt, and pepper. Whisk all the ingredients together until they form a smooth liquid. Serve the coleslaw immediately. You don't want keep this around too long; it's a same-day serve-it-right-away recipe.